We packed up the groceries that I bought at Union Square Farmers Market and the Chubby Bunny CSA veggies on Thursday night and drove out to Southampton, braving the monsoon-like rains and horrific traffic geting out of the city, to start the 4th of July weekend early. Tonight, 4th of July eve, Henry grilled the Arcadian Pastures local, grass-fed top round steak which I served with a homemade parsley, garlic and olive oil sauce made with parsley from the garden and CSA garlic (think liquidy pesto sauce) to go with the steak, sauteed baby swiss chard (also from Chubby Bunny CSA) and garlic scapes (saute the CSA scapes in olive oil til soft then wilt the chard - add salt and pepper to taste) and slow grilled red onions ( sliced thin, then coated in olive oil and cooked in a basket on the outside grill to get a grill flavor then transfered to a pan on the stove over a very low heat for a half an hour to caramelize and cook through). Everything was local except for the olive oil, salt and pepper! Henry and I discussed (at great length) how we were going to cook the grass-fed beef knowing that it was it leaner than what we get from the butcher but a tougher cut than porterhouse or filet mignon.We cut the steak in two pieces cooking half of it over medium heat (then served rare cut in slices like a London Broil on the diagonal) and the other half was cut into slices (also on the diagonal) before cooking and coated with olive oil and grilled for a very short time also over medium heat so as to serve rare and not toughen the protein. Our conversation over dinner included a debate over which method (mine was the whole steak method and his was the sliced steak method) resulted in a juicier, more tender piece of meat. Both were yummy and the debate rages. 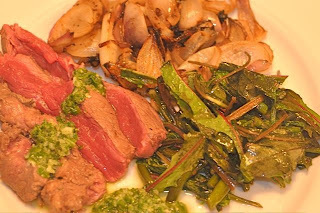 See more about the steak on the July 1 post regarding Arcadian Pastures-grass fed beef, and the farmer Laurent who I met at the Union Square Farmers Market.